Panduit QuickNet and Opticom Fiber Enclousers ready to ship today. 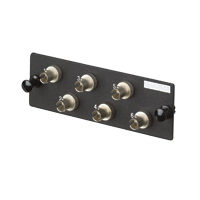 Panduit FAP12WBLSC SC FAP loaded w/12 SC simplex MM fiber adapters (Black) w/phosphor bronze split sleeves. 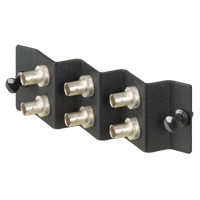 Panduit FAP6WBLDSC SC FAP loaded w/6 SC duplex MM fiber adapters (Black) w/phosphor bronze split sleeves. Panduit FAP6WEISC SC FAP loaded w/6 SC simplex MM fiber adapters (Electric Ivory) w/phosphor bronze split sleeves. Panduit FAP12WEISC SC FAP loaded w/12 SC simplex MM fiber adapters (Electric Ivory) w/phosphor bronze split sleeves. 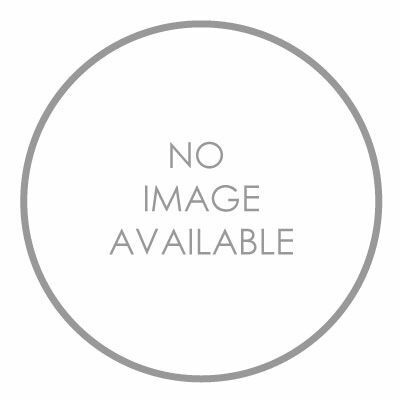 Panduit FAP6WEIDSC SC FAP loaded with six SC duplex multimode fiber optic adapters (Electric Ivory) with phosphor bronze split sleeves. Panduit FAP6WBUSCZ SC FAP loaded w/6 SC simplex SM fiber adapters (Blue) w/zirconia ceramic split sleeves. Panduit FAP12WBUSCZ SC FAP loaded w/12 SC simplex SM fiber adapters (Blue) w/zirconia ceramic split sleeves. 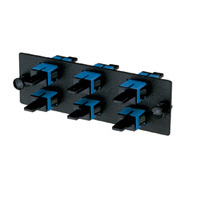 Panduit FAP6WBUDSCZ SC FAP loaded w/6 SC duplex SM fiber adapters (Blue) w/zirconia ceramic split sleeves. 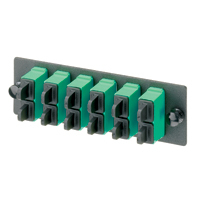 Panduit FAP6WAGSCZ SC APC FAP loaded w/6 SC APC simplex SM fiber adapters (Green) w/zirconia ceramic split sleeves. Panduit FAP12WAGSCZ SC APC FAP loaded w/12 SC APC simplex SM fiber adapters (Green) w/zirconia ceramic split sleeves. 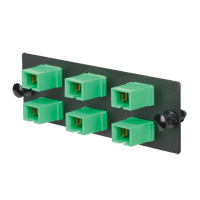 Panduit FAP6WAGDSCZ SC APC FAP loaded w/6 SC APC duplex SM fiber adapters (Green) w/zirconia ceramic split sleeves. Panduit FAP6WSTZ ST FAP loaded with six ST simplex singlemode fiber optic adapters with zirconia ceramic split sleeves. 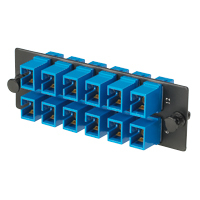 Panduit FAP6WST ST FAP loaded with six ST simplex multimode fiber optic adapters with phosphor bronze split sleeves. 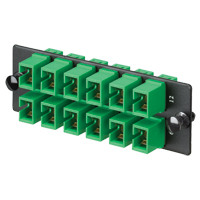 Panduit FAP6WSTA ST FAP (angled) loaded with six ST simplex multimode fiber optic adapters with phosphor bronze split sleeves.